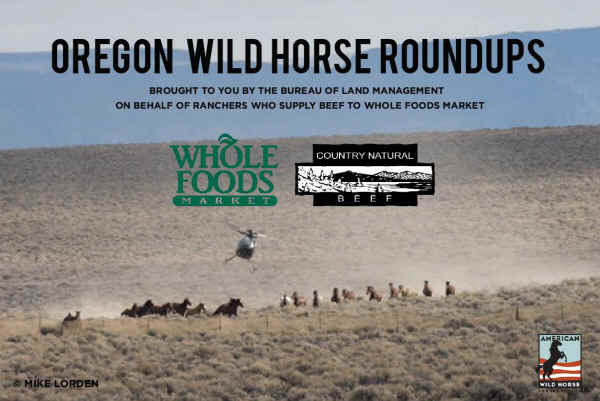 Ranchers (Country Natural Beef) who sell beef to Whole Foods Market are behind the largest mustang roundup of 2015-2016 now underway in southern Oregon. Right now, wild horses are being brutally rounded up, removed from their families and their homes on the range, all so that ranchers can profit by selling beef to Whole Foods. Whole Foods then markets this beef as “grass-fed” to its customers and sells it at a premium. Don’t let Whole Foods pass the buck. The natural foods giant must incorporate mustang safe standards into its animal welfare policies. This is NOT something All-Creatures.org recommends because there is no such thing as "safe meat standards" but if you want to sign the petition from American Wild Horse Preservation, that's up to you: Tell Whole Foods: Adopt Mustang-Safe Meat Standards.